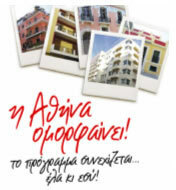 Athens brightens up, the program continues… Join in! In early July 2003 the facades upgrade program was launched with the hope that our city can change, that it can become more beautiful. It was just one year before the Athens Olympic Games when the City of Athens took the decisive step: to change the face of Athens; a face where the prevailing color was the grey smog on the buildings, which has been untended for decades. The City of Athens established the “New Face for Athens” consortium, the agency which is in charge of the implementation of the facades upgrade program, without unnecessary red tape, but with a lot of facilitations for better, more prompt and more essential services rendered to the citizens. During the first 19 months of operation of the Consortium “New Face for Athens”, its staff members have serviced, either by phone or in person, more than 11.200 citizens. In addition to that, they have visited building assemblies, when invited, in order to elaborate on the advantages of the program, the participation procedure and its goals, as well as to answer to any of the apartment owners’ questions. After 19 months of the program’s implementation, it is obvious that it is a success and that it can fulfill it basic aim: Athens today is a city which gets better and brighter every day. In the framework of the program, more than 2.550 participation applications have been submitted and the facades of more than 1.700 buildings have already been restored. Having a valuable expertise in such a complex and pioneering project, the City has both the will and the obligation to continue the effort for upgrading the urban environment of Athens with the same determination, since the vision behind it is continuous and very strong: a new, friendlier and more humane Athens. 2520 Buildings have entered the facades upgrade program 11200 Citizens have made contact with the consortium’s staff members and have been informed about the procedures and the advantages of the program. 1600 (and more) buildings have already completed the restoration of their facades. A very important project is underway in Athens, changing the city’s image by the day. Today Athens is a city with more color, a city with more brightness. For further information on the program, contact “New Face for Athens”, located at 11 Voulgari St, Omonia Square, on 210 520 3120-9 daily from 9:00-18:00. Alternatively, call the Citizens Helpline on 195.